Better LearnDash styles. 80+ customizable options. Improve your LearnDash design today. Every line of LearnDash CSS has been rewritten. Display "X of Y steps completed"
All plans are subscriptions & automatically renew yearly. Cancel anytime. We do have a free version that improves upon the default LearnDash design, but there are no options in the Customizer for you to change. Give it a try, and if you like what you see, come on back and consider going pro. 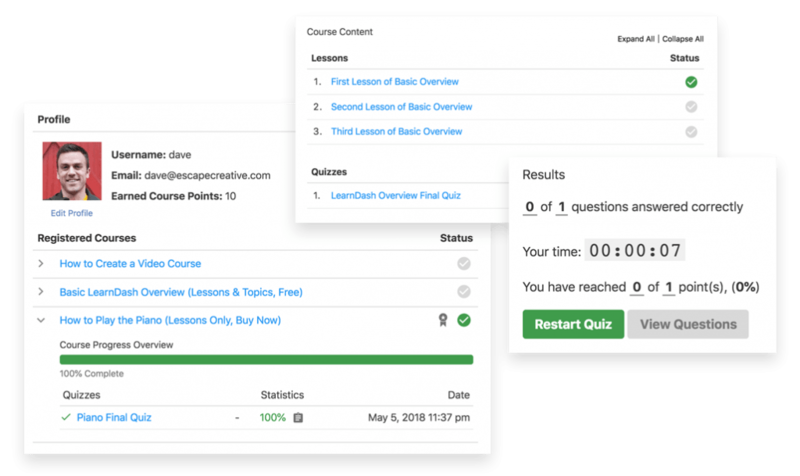 Design Upgrade Pro for LearnDash has been designed to work with just about any theme. However, there are a few themes we are aware of that already use custom LearnDash styles. If you have already selected a theme, and would like us to confirm whether our plugin will work, just shoot us an email with a link to your website and we’ll take a look. We have tested it & can confirm compatibility with Boss. by BuddyBoss*, Astra, Divi, Avada, GeneratePress, OceanWP & all default WordPress themes (Twenty Seventeen, Twenty Sixteen, etc.). * You must deactivate the “Boss for LearnDash” plugin. Can I change font sizes? We use a stylesheet to reset all font sizes to match your theme’s default styles. We believe a well-built theme should carefully set font sizes across your site. In an effort to promote consistency across your entire site, we have intentionally excluded font sizes from the Customizer. However, if you need to update a font size for any LearnDash element, we’ll gladly provide you with custom CSS to do so (even do it for you if you provide us access). Can I use custom icons & checkmarks? If you purchase the plugin, we’d be happy to send you some custom code to use your own icons. We plan to make this a feature within the plugin at some point in the future. How is this different from Snap Orbital’s Visual Customizer? More options: Simply put, you can do more with our plugin. 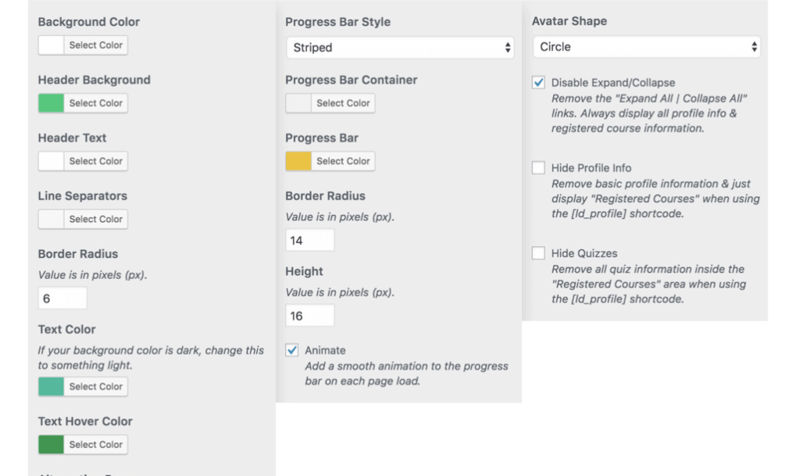 Hide elements, move things around, disable features, and more complete control over the design. Cleaner code: Visual Customizer adds ~1,200 lines of unminified CSS to the <head> section of your site. We bundle a base set of styles in one external file, and minify our CSS for better performance. Theme compatibility: We’ve carefully crafted & tested our styles to work with some of the most popular WordPress themes on the market, including Astra, Divi & GeneratePress. We continue to work with new customers on compatibility with their themes, and will update the plugin to support as many as possible. Can I customize LearnDash Add-Ons? Yes! 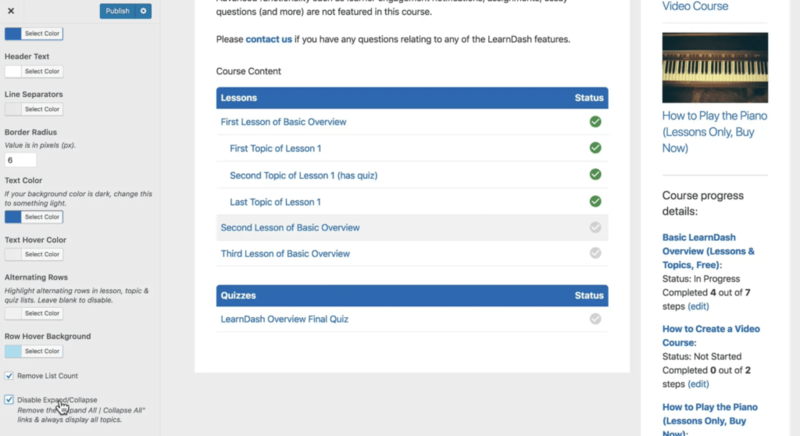 There are 25 design options for the LearnDash Course Grid add-on. It was our favorite feature-set to develop thus far, and we think you’re going to love it. We might add support for other add-ons in the future. If you have suggestions, please let us know. Can I still use the plugin if I don’t renew? Absolutely. Once purchased, the plugin is yours forever. For the first year, you’ll receive support, updates & new features. After that, the plugin will continue to work, but you’ll need to maintain an active subscription to continue receiving support, updates & new features. Does my plan renew automatically? Purchased on or after Nov 2, 2018: Yes. Your subscription will automatically renew every year, until cancelled. You may cancel any time from your account. Purchased before Nov 2, 2018: No. You will need to return to the site to renew your plan. Don’t worry, we’ll send you an email reminder when your expiration date is approaching. What’s the difference between plans? Every plan includes all features, and is available to receive support & updates for 1 year. The only difference between plans is how many sites you can install the plugin on. If you would like to use it on 2-5 sites, choose the 5 site plan. Have more than 5 sites? The 20 site plan is for you. If you’d like to use it on more than 20 sites, shoot us an email and we’ll work something out. Sure! You can upgrade at any time, and you’ll only pay the difference between plans. If you have any other questions, please send us an email and we’ll be happy to help. Our goal is simple: to provide you with the knowledge, tools & services to build more functional, more beautiful websites. Escape Creative, LLC © 2007-2019. All rights reserved.